For close to half a century the International Arabian spotlight has illuminated the beautiful horses of the Polish Arabian state-owned studs. What many Arabian enthusiasts don't know is that the horses of the state-owned studs came from Polish private breeders - some of them nobility, but many simply individuals passionately devoted to the Arabian horse. Now the indomitable spirit for which Poland is known is resurfacing in the surging return of private Polish breeders to the world of Polish Arabians. In 1989 Polish individuals were allowed to bid at their Arabian auction for the first time. Six short years later their horses won two of Poland's three most important horses races - the Derby and the Oaks, and set a new track speed record at 1,600 m. The private breeders have sponsored their own Arabian societies, a championship; established private breeder representation with WAHO, and even a stakes race on International Arabian Race Day. Of course, competition and self-organization have only made these breeders stronger. How is it that the private breeders have achieved success so rapidly? To begin with, they have access to some of the finest mares and top state stallions in the world. Second, there's no mass production - their studs are confined in size and the programs individualized for the temperament and needs of each horse. Third, with wider participation in breeding there are many more points of view, thus less traditional breeding decisions are made - which can bear fabulous fruit. Fourth, they have no inhibitions to search for the bloodlines of the great stallions like Wielki Szlem, Witraż, Bandos, Bask, etc. at the circus, or in the international marketplace. Fifth, their horses are trained for the track with a program tailored for each one, not by fitting the prescribed program. Finally, in their relative isolation they have the luxury of taking risks by following their instincts and passions. A rich heritage permitted the postwar production of the world's greatest Polish Arabian stallions and mares, and the current crop of private Polish breeders will command attention in the years to come. Much has been wriitten about the origin of Arabian horse breeding in Poland and the government-run Arabian stud farms. Much less has been written about the role of the private breeders. After World War II, Arabian horse breeding became primarily a monopoly of the state - the property of the larger prewar studs owned by the aristocracy was nationalized by communist authorities and the newly established state studs bought up horses from the small farms. Political and economic changes in Poland, whch began in 1989, nurtured a revival of private breeding. In 1989 the monopoly was broken and for the first time private breeders could buy Arabian horses, including purchasing at the Polish auction. The few breeders who had managed in one way or another to develop and keep a small band of horses gradually increased in number, and in 1991, the Polish Association of Arab Horse Breeders was established, incorporating the objectives and regulations of its prewar predecessor, the Association of the Breeding of Arabian Horses. A newsletter, Kurier Arabski, is issued regularly to the Association's 30 full members. The members own over 25 percent of all Arabian broodmares in Poland. The group actively promotes the private breeding of Arabians, provides assistance to newcomers, sponsors one of the classes at the Polish National Show (sponsorship began in 1994), a private breeder championship, and furnishes prize money for one of the Arabian races in Warsaw. To understand the conditions under which current private breeders operate, a review of recent history becomes important. World War I and the Russian Revolution completely destroyed the Branickis' Bialocerkiew Stud and Walenty Abramowiez's Saehny Stud, and nearly destroyed the Sanguszkos' Slawuta and Gumniska studs, the Potockis' Antoniny, Count Dzieduszycki's Jezupol, and Prince Czartoryski's Pelkinie. After gaining political independence during this time, the Poles energetically started to reestablish Arabian breeding programs. Thirty-four members founded the Association of the Breeding of Arabian Horses, the main goal of which was to develop and improve Arabian horse breeding in Poland. To that end, the group built a racetrack in Lwow in southeastern Poland, where the first Arabian races took place in 1927. The first volume of the Polish Arabian Stud Book, published in 1926, lists 56 broodmares; from 1918 to 1930, private breeders imported 27 broodmares. Among Prince Roman Sanguszko's notable imports were the stallions Kuhailan Haifi and Kuhailan Afas, both of whom founded renowned sire lines. The last stud book published prior to World War II listed 171 broodmares belonging to 54 different owners. The largest stud was Janow Podlaski with 34 broodmares; followed by Gumniska with 14 mares; Pelkinie (Prince Witold Czartoryski) and Behen (Counts Jozef and Roman Potocki) with eight mares each; Dobuzek (Mr. Wladyslaw Kolaczkowski) and Ujazd (Baron Willem Bicker) with seven mares each; and Lopatki (Stanislaw Sztamler) with five mares. Many studs (23 of them) had only one broodmare. The best breeding material was collected at Janow Podlaski State Stud, the breeder of the noted sires Ofir, Witraz, Wielki Szlem, Witez II, Enwer Bey, Trypolis, and Fetysz. Junior Champion Mare and Best of Show at the Second Private Polish Breeders Championship, May 31, 1996, Warsaw. While some private breeders had ambitious plans, it was difficult for them to compete with Janow Podlaski. One of them, however - Mrs. Teresa Raciborska of Breniow Stud - earned a place of honor in Polish Arabian breeding for producing the stallion Amurath Sahib (35. Amurath II x Sahiba by Nana Sahib), the maternal grandsire of *Bask, among other breeding accomplishments. Several private breeders exported their horses to other European countries and the United States. In the 1930s, General J. M. Dickinson of Franklin, Tennessee, imported *Liliana (Linkoln x Czapla by Bakszysz) and her daughter *Sielanka (by the American-bred Antez), both bred by the Estate of Jana Kleniewskiego; *Mattaria (Kafifan x Koneha by Sourour), bred by the Counts Roman and Jozef Potocki, and her in-utero son *Derazne (by Taureg), bred by Count Roman Potocki; *Latif (Antez x *Lassa by Koheilan I), bred by Tadeusz Gniazdowski; *Babolna (15urbar x Bona by Mazepa), bred by the Sokolowa Estate; *Ugra (Kuhailan-Kruszan x Sahara by Dzelfi Mlecha), bred by Prince Roman Sanguszko; and *Babolna (Durbar x Bona by Mazepa), *Czubuthan (Dzingishan III x Ryfka by Mazepa); Ba-Ida (Flisak x Pomponia II by Mazepa I), her daughter *Kasmira (by Kaszmir), and *Aeniza (Dzingishan III x Fanfara by Kohejlanj, all bred by Prince Witold Czartoryski at Pelkinie Stud. Also in the 1930s, Henry Babson of Chicago brought in *Sulejman (Fetysz x Fasila by Rasim), bred by Baron Willem Bicker, and *Azja IV (Landsknecht x Asra by Gazal-1), bred by J. Czerkawski, Bezmiechowa Stud. In American breeding, *Azja IV is noted as the dam of Azraff, an important sire in the Gainey breeding program. During World War II, many Polish breeders were killed, their studs destroyed, and their horses lost. The Russians confiscated many dozens of Janow Podlaski's finest Arabians, the Germans took their choices, and some horses came to the United States as war booty. By the end of the war in 1945, Poland could count only 71 purebred Arabian mares and fillies saved from 13 Polish studs and one Hungarian stud. Postwar, the Gumniska and Pelkinie Arabians became state property as a result of the so-called agricultural reform, and some broodmares were bought by the newly established state studs. These privately bred horses, now forcibly state property, went on to produce some of the best for the state studs. One such mare, Balalajka (Amurath Sahib x *Iwonka III by Ibn Mahomet), and her daughter, Arfa (by Witraz), were purchased from Mrs. Jerzy Bakowska for Albigowa State Stud. There Balalajka produced *Bask (by Witraz) and his full sister Bandola. Seven mares from Pelkinie Stud were bred to noted stallions (such as Wielki Szlem), leaving valuable progeny like Abu Afas, Arcus, *Carycyn, *Czester, and Badr Bedur. The Dobuzek mares also founded valuable families. From Ujazd Stud came seven mares, the most precious of which were Elza, the dam of Celina (by Witraz), a ehampion mare in Great Britain; Ellora, the dam of the stallions Ellorus (by *Krezus), EI Azrak (by Faher), and *EI Paso (by Czort); and *Elzunia, the dam of Etna (by Faher), who produced the stallions Eternit (by *Bandos PASB), Etnograf (by Engano), Etap (by Celebes), and Etan (by Czort) and the mare Etna (by Faher), who produced Etruria (by Palas) - Polish; European, and World Champion Mare. Wodzislaw Stud, founded in 1934 by Count Antoni Lanckoronski, saved three mares including Amneris (Amurath Sahib x Elsissa by Floks), the dam of Aquinor (by Miecznik), whose line is valued for beauty and refinement, and *Aramus (by *Naborr), U.S: and Canadian National Champion Stallion, Canadian National Champion Park, and U.S. National Champion Formal Driving. Some of the members of the Polish Association of Arab Horse Breeders. From Gumniska came Ferha (Kuhailan Abu Urkub x Udzda by Kuhailan Kruszan) who produced the stallion Faher (by Trypolis), the grandsire of Banat, a champion in Great Britain and maternal grandsire of Penitent, 1985 Polish National Champion Stallion, 1987 European Supreme Champion Stallion, and sire of Kawalkada, 1993 U.S. National Champion Mare. Gumniska also produced Forta (Kuhailan Abu Urkub x Porta by Nedjari), the dam of Czort (by Wielki Szlem), noted Polish race sire and sire of 'El Paso, 1976 U.S. National Champion Stallion. From the Zarczewskis' Oplytna Stud came Sabda (Miecznik x Safta by. Pielgrzym Thuja), the dam of Sabellina (by Abu Afas), an outstanding race mare in Poland and dam of Sambor (by Czort), U.S. National Champion Racehorse. The only mare saved from Roman Krainski's Zabawa Stud was Eleonora (Witraz x Zmora by Caid), who produced'Exelsjor (by Aquinor) and El Trypoli (by Trypolis). Zlota Iwa (Arax x Cesima by Witraz), originally owned by Mr. J. Maryanski of Bratkowice Stud in the province of Rzeszow, came to Michalow State Stud in 1963, where she became an esteemed broodmare and founded a large and valuable family. Breeding Arabian horses in the immediate postwar years of communist Poland was far from easy, as Arabians represented the prewar aristocracy to those in control. (Only one private breeder was listed in the first postwar stud book.) At the end of the 1950s, even the state studs were forced to cut back on the number of mares, and several valuable broodmares - among them daughters of Witraz and Wielki Szlem were sold without registration papers to local farmers as workhorses. European circuses became major buyers from the state Arabian studs. One little mare sold to a Polish farmer focused worldwide attention on Polish breeding through her descendants. Lafirynda (Miecznik x Lala by Amurath Sahib), purchased from her farmer owner in 1960 by Mr. Cwaklinski from Pincezow (near Michalow State Stud) was sold one year later to Patricia Lindsay of Stockings Farm, England. There she produced the filly Lalage (by the Polishbred sire Gerwazy), who was sold to Sweden. Lalage was bred to Nureddin (by Witraz), a stallion bred at Albigowa and sold to a Swiss circus in Poland's leaner years, and produced Aladdinn, 1979 U.S. National Champion Stallion and sire of four U.S. National Champion Stallions and one U.S. National Champion Mare. Private breeding in Poland regained its first real toehold through the purchases of Zygmunt Braur of Dobrow, a local farmer who purchased Wielka Zorza (Wielki Szlem x Zorza Pelkinska by Nana Sahib I) and Murcja (Comet x Muszkatela by Witraz) in 1960, making him the senior private breeder in Poland. Wielka Zorza produced only one foal for Braur, the filly Wielka Este (by El Trypoli) who was sold to Sweden where she left valuable progeny. But Murcja became the foundation of Braur's Oaza Kuhailan Stud. Two of her descendants were sold to Sweden, including her daughter Melhafa-Ed-Areg by El Trypoli, (who was later sold to the United States), with her son Ibn Czardasz (by Czardasz), who became a chief sire at Mr. Saeter's stud in Norway. Megaraa (Murcja's daughter by Branibor) produced the stallion Mehmet Ibn Sabbat (by Sabbat) and the mares Merzich-Hanum (by Sabbat), Medres Aga (by'Mellon), Medressa Kufi (by'Mellon), and MuFarah (by Algomej), the latter of whom is still producing. In 1982, Megaraa-was sold in foal to Banat at the Polish Prestige Sale to Patterson Arabians and exported to the United States. The stallion Farah-Tai-Pan (*Pepton x Farah Aisha), bred and owned by Andrzej Ou. In 1967, Murcja foaled Ben-Comet (by Czardasz), who became the first privately bred Arabian permitted to race at the Warsaw track in postwar Poland (only horses bred by the state studs had raced until that time). Ben-Comet raced three seasons, established a good race record, and was sold in 1973 to Leon Rubin; owner of Sir William Farm in Hillsdale, New York. BenComet claimed a US Top Ten Park title, and was eventually sold to Elsinore Arabian Stud in California, where he sired a number of foals. Murcja must also be honored for her production of Murat Hanum (by Muharyt) in 1974, a very beautiful Kuhailan mare, who died in 1993. Murat Hanum produced the sons Murat-Gazon and Murat-Bej (both by Gazon), chief sires at Mr. Braur's stud; Murat-Akbar (by Aloes), used for four years in private breeding until his exportation to Italy in 1992; and Murat-Nur (by Banat), at one time on lease to Mrs. Eleonore Hussmann of Romerwall Stud in Germany and now used in private breeding in Poland. In 1995, Mr. Braur's Oaza Kuhailan Stud was comprised of nine-Arabians, including the two broodmares Mu-Sahra (Banat x Mu-Farah) and Mu-Gaza (Muharyt x Murat-Hanum), and four stallions Murat-Nur (Banat x Murat-Hanum), Mu-Nazir (Banat x Mu-Sahra), Murat-Gazon (Gazon x Murat-Hanum) and Murat-Bej (Gazon x Murat-Hanum. A breeder of Arabian horses for 38 years, Mr. Braur was honored in 1994 by the Polish Association of Arab Horse Breeders for his many efforts on behalf of the Arabian breed. The mare Farah-Buffi (Argo x Farah Aisha), winner of the 1994 Oaks, bred and owned by Andrzej Ou. Just before the Nowy Dwor horses were transferred to the rebuilt Janow Podlaski State Stud, in 1960, Kazimierz Galuszko of Kurdwanow (near Krakow) bought Musailima (Wielki Szlem x Tecza by Nizam Pasza) and Gastronomia (Marabut x Ofirka by Ofir). Both mares produced colts by Comet. Musailima's son Mustafar, rescued from a Swedish circus, became Swedish National Champion Stallion in 1970, was imported to the United States in that same year and was named 1974 U.S. National Top Ten Park AOTR. Gastronomia was purchased by Michalow State Stud in 1963; there she produced Grojec (by Comet), an important stallion in England and the United States; Gedymin (by Gwarny), sire of Scottsdale, Buckeye, Regional, and National winners in the United States; and Gilza, the grandam of the race stallion *Gil (by Probat). A few years later, in 1964, Wladyslaw Sadowski of Stobno in the province of Poznan became the owner of Dakaszma (Kaszmir x Dalama by Dzingishan III), a 1944 mare bred at the Adamowka Stud of the Princes Czartoryski. Dakaszma foaled Dzamila (by Cedr) in 1965, and Dzamila produced the 1977 filly Daula (by El Azrak) who became the foundation mare of Tadeusz Skrok's stud in Rynarzew, Bydgoszcz province, central Poland. In 1988, Daula foaled a colt, Dodatek, who was exported to Germany; then in 1992, Daula, with her 1990 daughter Dogrywka (by Algomej), was sold to Italy. In the 1960s, sales of state-stud bred horses were sporadic and very limited. Some sales were under "very adventurous" conditions and occasionally some of the privately owned Arabians were not allowed registration in the Polish Arabian Stud Book. But some sales had long-lasting and positive effects. Mrs. Anna Debska, then of Warsaw, purchased the mare Maciejka (Sedziwoj x Mira by Wielki Szlem) in 1966, the same year that Muharyt (Witraz x Munira by Kaszmir), "the forgotten Witraz son," was discovered in a military riding club and purchased by Mrs. Wanda Jackowska of the province of Warsaw (Mrs. Jackowska helped organize the Polish Prestige Sales). Muharyt was sold to Mr. Andrzej Ou of Rozalin in the province of Warsaw, another veteran of private breeding, and left a number of valuable broodmares in private breeding studs. Later, he was purchased by Janow Podlaski State Stud, where he was used until 1978. Anna Debska also purchased the stallion Mokan (Grand x Mokdiara by Hadjar), bred by Michalow State Stud, to whom *Maciejka and her daughter Murhejka (by Muharyt) were bred. In 1977 *Maciejka's daughter Marunka (by Mokan) was foaled and later purchased by Mrs. Jackowska to become her foundation mare. Marunka and her offspring were transferred to Hanna and Jan Iganski in 1991, shortly before the tragic death of Mrs. Jackowska. One of Marunka's sons, Marc (by Alcazar), has been very successful at the race track, placing fifth in the 1992 European Prize before being sold to the United Arab Emirates where he successfully carries the banner for Polish Arabian racing bloodlines. 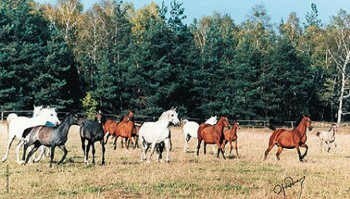 Jackowice Stud (in Mrozy near Warsaw) has 10 Arabians, including four broodmares descended from *Maciejka. In 1985, *Maciejka's granddaughters *Murkana (Mokan x Murhejka) and *Mgla (Banat x Mgielka by Mokan) came to America: *Murkana to Betsy Burger, Oeala, Florida; and *Mgla PASB, imported by Anna Debska who now lives in the U.S. That same year, Mrs. Debska transferred three mares - Macierzanka (Mokan x *Maeiejka), Medium (Bukszpan x Mgielka by Mokan), and Maranta (Dambor x Miszka by Muharyt) to Andrzej Waliszewski at Cholewy near Warsaw, where they became his foundation broodmares. After being used for breeding, Macierzanka and Medium were exported to Italy, and Maranta was sold to Belgium. At Waliszewski Stud at Cholewy there are nine Arabians, of which the four broodmares are all descended from *Maciejka. Over the years, resourceful private breeders, although shut out by the state studs, saved some significant horses for all Polish Arabian breeders. In 1972, Andrzej Ou purchased his foundation mare Falbanka (Banio x Fanfarona by Rozmaryn) from the Polish State Agricultural Farm at Kruslewice, where she was used to pull carriages. Falbanka's granddaughter, Farah-Buffi (Argo x Farah-Aisha by *Probat), won the 1994 Oaks, one of Poland's most prestigious races, and is notable as the first privately bred Arabian to win such an important race in postwar Poland. In 1997, Andrzej Ou's winning Sheika Arabians numbers a mere two mares: Farah-Buffi, who was bred to *Pepton for a 1996 foal; and Farah-Bersa (Pers x Farah Aisha by *Probat), who is in race training at the Warsaw track. In 1986, a second generation of private breeders came into being, among them Krystyna and Stanislaw Duda of Mylnczyska (near Kurozweki State Stud in the province of Kielce). They were the first Polish citizens permitted to bid at the Polish Prestige Sale, where they bought two mares: Aktorka (Embargo x Arena by Gwarny), bred at Kurozweki, and Wiklina (Fason x *Wieczerza by Tryptyk), bred at Bialka State Stud. The Dudas also persuaded Zygmunt Braur to sell them the mare Mu-Farah (*Algomej x "Megara by Branibor), their third foundation mare. These mares continue to be valuable broodmares for Polish breeders, and Wadi (Wieden x Wiklina) and Ahmed (Wieden x Aktorka) have won and placed at the track. Other private breeders who became active in the late 1980s include Lech Blaszczyk from Lucmierz (in the province of Lodz), who bought the mare Magnolia (Fason x Maskotka by *Bandos PASB), bred by Bialka State Stud, at the Polish Prestige Sale. In 1990, he acquired Albania (Gwaryo x *Aleksja by Czort) and, in 1991, Galicja (*Algomej x Gromadka by Tryptyk). The offspring of all three mares went to race training at the Warsaw Traek. Albania's daughter Abisynia swept the 1995 Kuheilan I Stakes, Bialka Stakes and Sambor Stakes. In addition to Albania and Abisynia, Mr. Blaszczyk owns Pliszka (Gwarny Y Pardwa), Alba-Rego (Alegro x Albania), Passa (*Eukaliptus x Pascha) and Erudycja (*Probat x Etola). Roman Pankiewicz with Biquest (*Bask x *Negotka) at Korfowe Arabians. In 1989 Krystyna Chmiel from Zamosc, in southeastern Poland, acquired Farah-Itaka (Muharyt x Falbanka) from Andrzej Ou as a foundation mare. Her 1990.fillies Farah-Aneta (by Boryslaw) and Walentyna (Monogramm x Wilnianka by Tallin), purchased in 1994 from Michalow State Stud (where Monogramm was on lease from the United States) are presently at stud. She is leasing the stallion El Amor (Wermut x Elstarna) from Bialka Stud for the second year. Also in 1989, Iwona and Wojciech Janowski from Opatowiec (near Michalow State Stud) purchased Kaskada (Banat x Kasetka by Etap), bred at Janow Podlaski. They also purchased the mare Areta (by *Set) from Harry-Sven Karlsson of Royal Sweden Arabians, who kept some of his Polish broodmares at the Janowskis' stud. Now they have three mares: Kora (Wagram x Kaskada), Ezla (*Wojslaw x Etruska) and Ewita (*Wojslaw x Elleida), and they purchased the stallion Expo (Wermut x Eksplozja) from Kurozweki Stud. In 1991, Boguslaw Dabrowski from Klepacze in southern Poland bought two Janow-Podlaski mares: Wiktoria (*Aloes x Wineta by Etap) and Salamandra (Alegro x Saragossa by Argo). Andrzej Wojtowicz was one of the top 15 money winners at the track in 1996. He has eight young mares: Matnia (Palas x Milada), Faszyna (*Probatx Fascynacja), Medytacja (*Europejczyk x Mekka), Gwaraneja (*Piechur x Gizela), Malwa (*Europejezyk x Malwina), Minoga (*Arbil x Miranda), Ela (*Europejezyk x Ettoria) and Piwnica (*Eldon x Pilina). Joanna and Peter Grootings founded Korfowe Arabians, in Kampinos near Warsaw, in 1991. They purchased three broodmares from Krystyna Duda: Mu-Farah, Aktorka, and Wiklina, plus their sons by Wieden (Palas x Wieza by Doktryner). In 1992, they bought three Michalow broodmares: Dulcynea (*Set x Dulka by *Gedymin), her daughter Dania (by *Endel PASB), and Glowica (*Pepi PASB x *Glownia by *EI Paso). A few months later, they acquired the Tersk-bred mare Namibia (*Moment x Narta by Topol) who produced Nehmesis (by Prizrak). In a reversal of the usual importing/exporting pattern, the Grootings brought Polish Arabians from the United States to Poland: two mares of old Polish bloodlines - *Petite Fleur (Arbor x Portia by Pohaniec) and SH Carmen (SH Patton x FTL Eleana by *Fortel) - and they leased the stallion Biquest (*Bask x *Negotka by Negatiw), the first *Bask son to be used in Polish breeding. Two stallions came from the Polish National Circus: Engar (*Bandos x Engracja by Comet), bred at Janow Podlaski, and Erfurt (*Bandos x Elwira by Elf, bred at Michalow. Earlier in 1995, the Grootings purchased the mare Etruska, sired by *Aloes and out of World Champion Mare Etruria, from Royal Sweden Arabians. Korfowe, with 33 Arabians, became the largest private stud in Poland. In 1995 they enlarged their operation, opening a racing stable with Michail Pietriakow, Poland's 1994 Jockey of the Year, as trainer and jockey. Dania (*Endel PASB x Dulcynea) with Damascus by Engar at Korfowe Arabians. The latest generation of private breeders includes Katarzyna and Michal Bogajewicz at Niewierz Stud near Poznan in western Poland. They have ten Arabians, including four broodmares, daughters of Eternit, *Set, *Arbil and Europejezyk. The stud of Marek Kalinowski, in northern Poland, numbers eight Arabians with three broodmares, daughters of Pepton, Woroblin, and Partner. Andrzej Strumillo, of Mackowa Ruda in northeastern Poland, has three mares, daughters of Etogram, *Wojslaw, and Pamir. Stefan Schaedler's two mares in his stud in western Poland are sired by Europezjczyk and Falsyfikat. At Bydgoszcz: Malgorzata Falkiewicz owns seven Arabians, including three - Mu-Farah, Wiklina, and Wedrowka (*Algierczyk x Wiorsta by Banat) purchased from Joanna Grootings, along with the stallion Zuraw (*Set x Zolna by Palas). The number of owners, breeders, and Arabian horse lovers continues to thrive in Poland's new political and economic climate. For the past 40 years, the breeding of Arabians has been dominated by the state studs, and the prices obtained at the annual Polish Prestige Sales kept most Poles from buying. Now, persons who formerly could only dream about Arabian horses, are able to buy foundation stock and breed their own Arabians. More and more Arabians are used for recreation, and in long distance competition in which their owners train and ride their own horses. Privately owned Arabians are causing a stir at the Warsaw track. In 1995, the Association organized the first show for privately bred fillies and colts. Private breeders now have access to the best state-owned stallions, a factor which contributes greatly to the quality of the foals they produce. Many of the best Polish professionals in horse breeding and veterinary care provide their knowledge and expertise to the community of private breeders, and the state studs find a growing market among the private breeders. Private breeders were more active than ever before during the 1995 and 1996 seasons. Joanna and Peter Grootings were the most successful private breeders and owners of Arabian racehorses at Sluzewiec. The sum of their earnings was third only after Michalow and Janow Fodlaski. In 1995 their four year olds Wadi (Wieden x Wilkina by Fason) and Ahmed (Wieden x Aktorka by Embargo), both bred by Krystyna Duda, won the Grade A (Produce) and Kurozweki Stakes, respectively, and Dekor (*Fawor x Dekada by Eternit) broke the track speed record at 1,600 m. In 1996 their four year olds Dekor, Dandy (Boryslaw x Dania), and Whiski (Wermut x Wedrowka by *Algierczyk) won the Derby, the PTKHA Stakes, and the Kabareta Stakes. In 1995, the Grootings sponsored the Korfowe Arabians Stakes, a 1,800-meter outing for three year olds. In other 1995 races, these privately owned horses were contenders: Andrzej Ou's Farah-Bersa (Pers x Farah-Aisha by Probat) and his Farah-Tai-Pan (*Pepton x Farah-Aisha by Probat); Stefan Rakoczy's Buli (Eksponat x Bosnia by *Gil) and his Zawisza (Eksponat x Zima by Embargo); and Andrzej Waliszewski's Margabia (*Gabaryt x Margilla by *Gil). At the 1995 Polish National Show, Michal Bogalewicz's Matura (*Arbil x Mitrega by *Probat) and Andrzej Ou's Farah-Buffi (Argo x Farah-Aisha by *Probat) competed in Mares Four to Six Years Old. At the 1995 Polish Prestige Sale, Leszek Tomaszewski of Lesna paid $6,000 for a Michalow-bred mare, Warszawianka (Balon x Warsowia by Tallin), bred to Cyprys, while Andrzej Wojtowicz paid the sarne amount for Faszyna (*Probat x Fascynacja by Etap); a 1988 mare bred at Janow, bred to *Arbil. In 1996 private breeders spent $23,000 for the four mares: Pytia, Arwistawa, Flauta, and Ekselencja. On May 10, 1997, the Association of Friends of the Arabian Horse in Poland was formed. The founders are an illustrious group of artists, breeders, and others: Joanna and Peter Grootings, Ludwik Maciag, Andrzej Novak-Zemplinski, Zofia Raczkowska, Stanislaw Ledochowski, Marek Poray-Heywowski, Zbigniew Prus-Niewiadomski, and Roman Pankiewicz. They plan to document and popularize Polish Arabians through an iconographic and historical archive, publishing activities (including CDs), and artistic events featuring the Arabian horse. Just as it is very difficult to imagine postwar state breeding without the contribution of the private breeders, it is difficult to imagine the present revival of private breeding without the contribution of state-bred horses. Let us hope that very soon the world will no longer make a major distinction between state-bred and privately bred and owned Arabian horses.